I love this watch. I wear it every day. A friend of mine said he could tell it was very expensive but it wasn’t. An interesting blend of elegance and chic modern trends, this watch is perfect for ladies who love fashion. 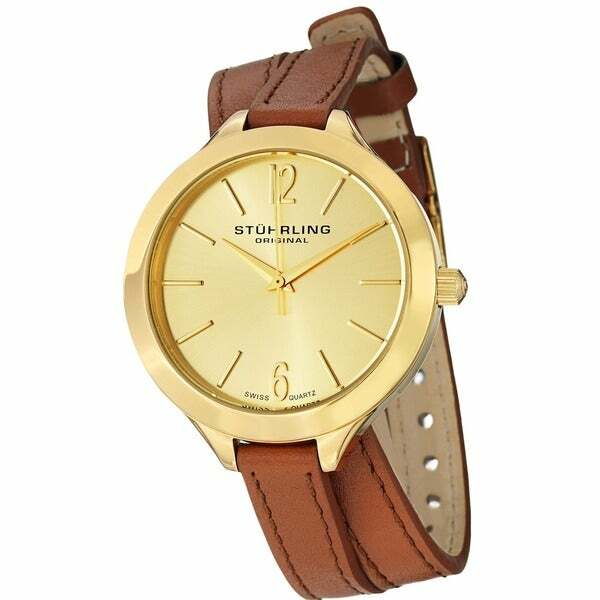 The sleek brown leather strap and goldtone bezel give the watch a stylish charm. The practical functions of this watch are as impressive as its fashionable looks. This piece is water resistant up to 165 feet and delivers dependable timekeeping. I searched everywhere for a double strap wrap watch that didn't cost a fortune. Overstock had so many to choose from it was hard to only choose one.I got the black band with silver dial. The face is extra large so I can easily read the time.and the band length is long enough to fit an 8 in wrist. I wear it everyday and even sleep in it. I don't even know I have it on. I love it ! I am very impressed with this watch. Purchased it for myself but may give it as a gift. The watch band is tan not brown. I love it. I already have a watch with a brown band. I wanted a tan band. Very pleased with the great price and quality. I need a longer strap !! This is the 2nd Stuhrling watch I've bought from O & I'm very disappointed that this wrap around strap is too short. need an extension have seen them but can't find them !! Keeping watch will keep looking for an extension strap. I read the reviews, and had some reservations, but ordered it anyway.. Glad i did! It's a beautiful watch, handsomely packaged... It does slide around on the wrist because the face is so large, but a little tightening of the strap and some wear and it's fine... I would suggest a longer strap for people who may have a larger wrist, but other than that it's a great watch! It keeps time beautifully, and for those who can't see worth diddly anymore (like me), i finally have a watch where i can see/read the numbers! I ordered this watch in gold/tan as an alternative to another double wrap watch which was selling for almost 4 times the cost of this one. I am so glad I took a chance on this, because it looks exactly as pictured, came in beautiful, premium packaging and fits perfectly. This is a steal for the price and I am seriously considering purchasing the black/silver one as well. I Made a Great Purchase This "Time"! I'm one of those people who don't rely on my cell phone to tell me the time. I like a good timepiece. I think of a watch more as an accessory that happens to tell time. I have a decent collection of watches. Dressy. Casual. Expensive. Cheap. Fashioable. They're fun! Anyway, I was drawn to this model watch because of the wrapped strap. I can't afford the original wrap-strap Hermes watch. But I enjoy finding similar ones. I was also drawn to this watch because of the availability of a red strap. There isn't much to not be happy with. The large face is great. I'm not keen on small watches. I like oversized. The strap is long for the wrap and I have thick wrists. It is a comfortable fit. The only slight disappointment is the width of the strap, I thought it would have been thicker. I should have studied the photograph more. That being said, it isn't a deal breaker for me. This watch is going to get a lot of love from me. But the thin strap in proportion to the oversized face is just a bit "off" to me. For the price point, though I cannot complain. This is a great watch for the money. Bought as a gift for my daughter and she really loves it. The watch looks much more expensive than what I paid and so far works without issue. It looks very sporty and trendy, and will be the favorite of my daughter for a long time to come. No regrets here and I highly recommend it. I've been searching for a casual watch that was easy to ready. I go through watches rather quickly and the Stuhrling brand had good reviews. I ordered the Gold/Tan watch and it arrived in just a couple days. It comes in a great presentation box that is perfect for gift giving. I get compliments on the watch every time I wear it. The case is bright gold (maybe a touch too bright for some), the leather band is good quality British tan color and fits my 7" wrist with 4 holes to spare. Warranty is 2 years and registration was easy on Stuhrling website. I love my new watch! This is a beautiful watch. I would have loved to keep it, but my wrist 7.5 inches is too large. I returned it without any problems and ordered another Stuhrling watch with a longer band. I love this watch. I wish I had gotten it in brown. But, the black is equally beautiful. I am thinking about ordering another for my daughter. The watch is nice, and works well. My only concern is that isn't very easy to put on my wrist because the band is wrapped around it is difficult to get it into the closier. I bought two watches from Overstock.com. I am so pleased with the quality and value . So much prettier in person than the online picture I ordered it from. Amazing , hassle free ordering and prompt delivery. Beautiful watch looks great with everything and made very well! I'm going to buy another watch and packaging is better than Tiffany's! Highly recommend you get this brand if you're in need of a watch! Very nice watch. I get lots of compliments. Bought this as a gift. Nice watch for the price. This is a good looking watch face, but the leather band isn’t as robust as I would like. I don’t mind it is thin and a double loop design. But the two together seem not fully complimentary. I am a Stuhrling watch fan. I like the look of the face of this watch, but do not care for the strap. No matter how I try the watch never sits on my wrist correctly. I have already started to look for a new watch and. Nice casual watch for my girlfriend, she really likes the way the band looks , seems to be good quality for the money. I would recommend for anyone looking for a good quality watch for a great price. Great watch, and it looks awesome. Holy cow! I just received my watch thru the mail just now and WOW what a nice surprise! It came in this elegant box, beautifully packaged and presented. Love the feel and look of this piece. I’m definitely keeping it and treasuring it! Thank you Overstock! "Love the watch from online pic, but can it be sized to fit my 5 1/4 inch wrist??" Thanks so much for your response. I figured I'd have to do that and already ordered, just didn't want it to fall off my wrist! Yes it has many notches in the strap. "do you it in black strap?" Hello lydia, the black-strap option is currently not available at this time. Items are restocked as they become available; however, we cannot guarantee an item will be restocked. Thank you for shopping with us. I have it in black and love it. Good value. Chic. I love the style and color, also the great price wow. "When will the brown/gold color option be back in stock? I"
Hello jmmorris27, items are restocked as they become available; however we cannot guarantee an item will be restocked. Thank you for shopping with us. "Will the brown/gold color option ever be back in stock?" Hello Johns164, items are restocked as they become available; however we cannot guarantee an item will be restocked. Thank you for shopping with us. "Am I correct, this watch is NOT battery run?" Hello candycain, the movement of this watch is Swiss Quartz which is run by battery. I hope this helps. Thanks for shopping with us. Hello lizaibiza316, this watch is made in China. Thanks for shopping with us!